Apple unveils HomePod, its smart wireless speaker | What Hi-Fi? At its 2017 WWDC conference, Apple has announced HomePod, its new Siri-controlled wireless speaker. The speaker stands just under 7in tall and is covered in a 3D mesh fabric which Apple claims boasts excellent acoustic properties. It uses an array of seven horn-loaded tweeters positioned around the bottom of the speaker that fire outwards, combined with a 4in upward-facing woofer. An internal microphone carries out automatic bass correction and you can choose between 'direct' and 'ambient' sound modes. Inside, you'll find various audio processing technologies designed to get the best audio performance possible, including real-time acoustic modelling that optimises the sound depending on where the speaker is placed. It's controlled by the same A8 chip found in the iPhone 6 and 6 Plus, the iPad mini 4 and the fourth generation Apple TV. 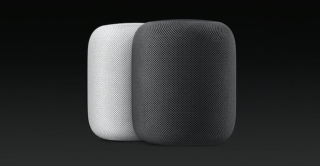 The HomePod can be controlled using a combination of Siri, Apple's voice assistant, and a line of six microphones placed around the middle of the speaker. Say "Hey Siri" and the Siri waveform lights up the top of the speaker, indicating that Apple's assistant is ready to listen. Siri can access and play your favourite music through Apple Music, but it can also answer questions based on other domains such as the weather, news and sports. You can also use Siri to set reminders and alarms. It will be interesting to see how Apple's speaker stacks up against Amazon Echo and Google Home, both in terms of intuitiveness and quality. Tim Cook claims The HomePod will "reinvent home music" - a bold claim given the breadth of multi-room options out there (Sonos is one name that immediately springs to mind). Whether it will or not, remains to be seen. The Apple HomePod is set to launch in December in the US, UK and Australia and will cost $349. It will be available in two finishes: White and Space Grey.